The Mets, and their fan base, are flying high this week after completing the subway sweep. This really couldn’t have come at a better time for this team. There was little, to no excitement, surrounding the Mets and as it was quickly becoming another forgotten season. It’s amazing how fast things changed for this team in just a week. It started with a late inning win against the Braves on Sunday leading into the subway series. Led by the late inning heroics of Daniel Murphy and David Wright, The Mets went on to win back-to-back dramatic games at Citi Field. You could just see the excitement and energy those two displayed after each key moment that made you realize just how much these games against the Yankees truly mean to both the players and fans alike. There may be no greater moment in the Mets 2013 season than that walk off win on Tuesday night against Mariano Rivera. For years, Mets fans have suffered through the likes of Armando Benetiz, Braden Looper, Billy Wagner and K-Rod closing out games, breaking our hearts when it mattered the most. All the while, we have watched Rivera become the greatest closer of all-time, helping the Yankees win champion after championship. I would say Mets fans are more envious of the Yankees having Rivera than anything else. We would have loved nothing more than to have him on our team, but the next best thing was beating him in what would be his final game against the Mets. The Mets went on to silence Yankee stadium in both games as they completed the season sweep of the Yankees. They did it in dominating fashion as the Yankees never posed any real threat in either game. You could just sense the vibe surrounding this team changing as the week went on. The team looks much looser and the fan base has come back to life as winning solves all problems. The Mets need to build on this 5-game winning streak and do it now. This is no time for a let down with 6 of their next 9 games coming against the last place Marlins. Now is the time for the Mets to continue to work their way back to .500 and keep themselves relevant. I don’t know if this team will ever return to the .500 mark this year, but for one week at least, the Mets are the Kings of NY. This is a well written, and highly entertaining, article. 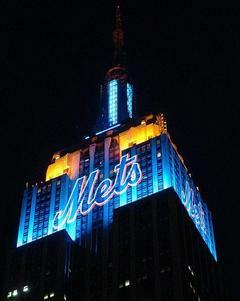 Go Mets! Nice Blog! Wish I was still around to watch this past weeks SWEEP!! PS. I dare you to challenge me to Mets Trivia!! Thanks! Glad you enjoy it. Trivia challenge sounds fun, how do we go about doing that?